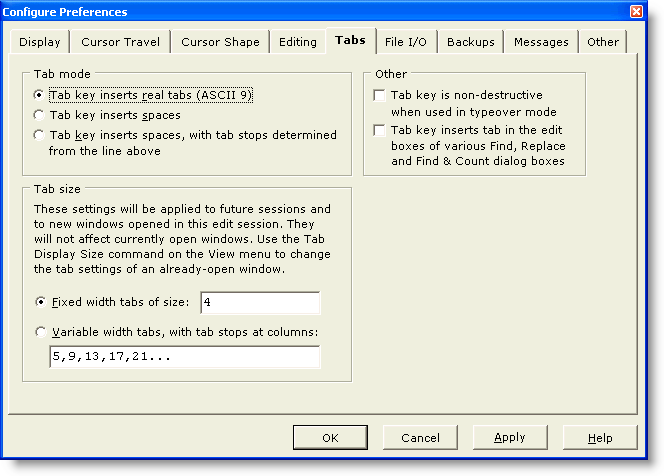 When this option is used the Tab key will insert tabs (character value 9) into the file. When this option is used the Tab key will insert an equivalent number of Spaces, in accordance with the current Tab Display Size. When this option is used, the Tab key will advance the text cursor to the next field of data as determined from the line above the current line. Use this option to set the default display size for fixed width tabs. This option sets the display size to be used for tabs in newly created windows, but it does not alter the tab display size of any editor windows that may already be open. The Tab Display Size command on the View menu can be used to set the tab display size for the current file, independent of this default value. Use this option to designate the columns at which variable width tab stops should occur. This option sets the tab stops to be used for tabs in newly created windows, but it does not alter the tab stop settings any editor windows that may already be open. The Tab Display Size command on the View menu can be used to set the tab stops for the current file, independent of this default value. When this option is checked, the Tab key will not overwrite text when used in Typeover mode. For a similar option that affects the function of the Backspace key, see the Configure | Preferences | Editing dialog page. When this option is checked, the Tab key with insert an actual tab character into the edit boxes of the Find, Replace, Replace Line Enders and Find & Count dialog boxes. Ordinarily, when the Tab key is pressed in a dialog box, focus shifts to the next control in the dialog box. This option can be used to override that behavior, making it easier to create search or replace strings that include the tab character.